The Abbey Hotel, is independently owned by Ian and Christa Taylor who purchased the property in early 2012. Since then they have undertaken a program of transformation to create a stylish city centre hotel that offers exceptional food, a lively bar and lounge area and interiors that provide a stylish backdrop to the ever changing art exhibition. 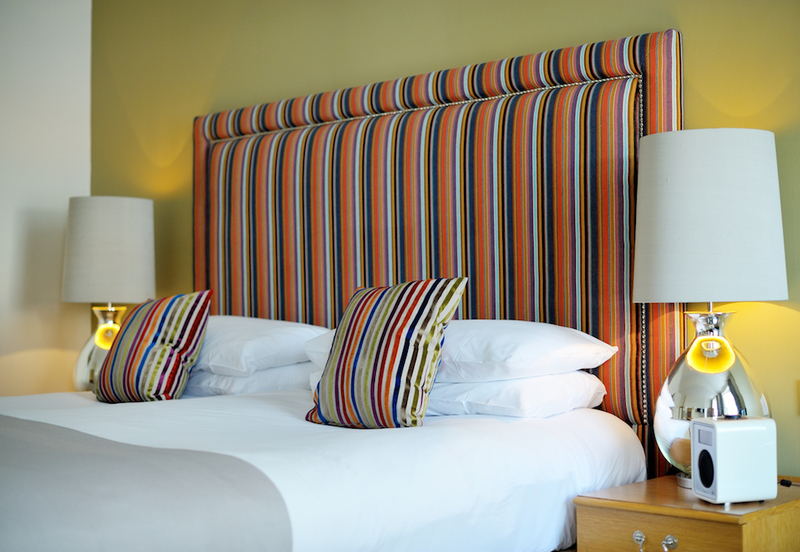 The 60 bedrooms all have bespoke Hypnos beds, free wifi, flat screen TV’s and DAB docking stations, bathrooms offer Ren amenities and fluffy towels. Smaller rooms are perfect for single travellers and those who are out and about, larger rooms are comfortable for longer stays and families. Food is an important part of the Abbey Hotel experience, The Allium Brasserie is headed up by Chef Patron, Chris Staines one of the UK’s most acclaimed Chef’s. Chris held a Michelin Star for several years whilst heading up Foliage at the Mandarin Oriental and has really made his mark on the South West restaurant scene in the short time he has been in Bath. The Allium is a relaxed restaurant with a lively ambience, Chris simply loves to create really good food from the best local, seasonal ingredients and has the happy attitude that you are just as welcome if you are lingering over one course as you are if you are indulging in the full gastronomic experience. It’s just about savouring the experience of good food and wine and enjoying the moment. Allium also happens to have one of the best Terrace areas in the city, open from Spring to late Autumn this is the place to people watch and absorb the ambience of this wonderful city. The ArtBar and Lounge has become the hub of the hotel, serving morning coffee and croissants, light lunches and stunning afternoon teas, it shares the relaxed vibe of Allium and is a popular meeting point. In the evening our resident mixologist Andrew Fisher changes the dynamics creating a lively bar area serving an exceptional range of spirits and cocktails, he loves to chat and share his knowledge of drinks and is always happy to create something new. 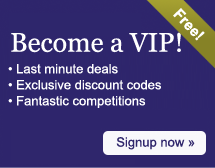 Whether you are visiting Bath for business or pleasure ” we look forward to welcoming you to The Abbey Hotel. 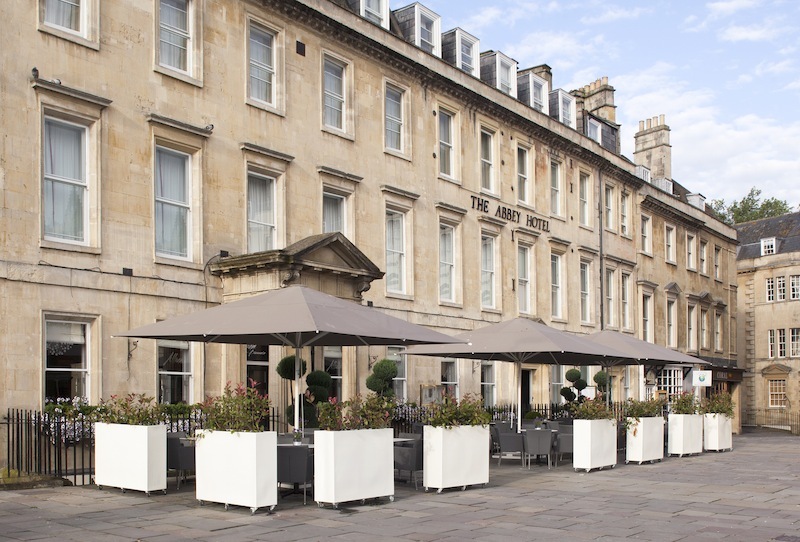 If you are looking for a meeting facility right in the heart of Bath then there is no better location than The Abbey Hotel. Our new meeting space, The Bolt-hole can accommodate up to 16 delegates boardroom style for day meetings and up to 30 theatre style for presentations. Benefitting from natural daylight and free wifi, the room is a convenient central space for offsite meetings and as we are located only a few minutes from Bath Station it is perfect for those travelling into the City. Day delegate, 24 hour and room only rates are available on request. 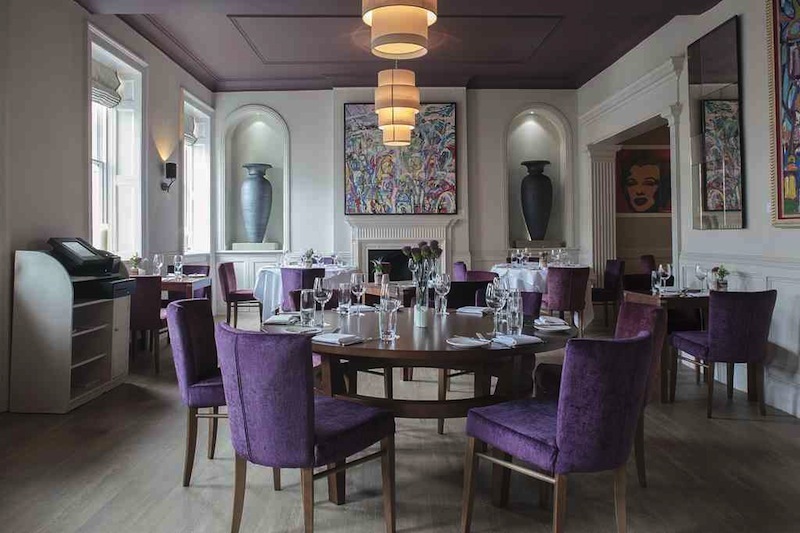 With its intimate, contemporary style, Allium Brasserie at The Abbey Hotel is a brilliant location in the centre of Bath for your wedding reception. Just a short stroll with your wedding party from your ceremony at either the Guildhall, Roman Baths, or St John’s Church, Allium can accommodate wedding parties of up to 60 people, and we guarantee no airs and graces and stiff formality ” just a relaxed atmosphere so you and your guests have a truly happy day. For smaller parties our Private Dining room can cater for up 16 guests, enjoy a space that is exclusively yours for your celebration. At the roundabout, take the 1st exit onto A46. Go through 1 roundabout. Turn left onto Cleveland Place and continue onto Bathwick Street. Take a slight right onto Sydney Place/A36. Continue to follow A36. PARKING: Like the majority of hotels in the centre of Bath, we do not have our own car park. However there are two car parks within 600 yards of the hotel. The closest car park is the pay and display in Manvers Street (BA1 1JL), which costs £12.50 for 24 hours (this includes the period from 8pm to 8am, which is free of charge) and is just a 3 minute walk from the hotel. We also recommend the car park at the new Southgate Shopping Centre (BA1 1AQ), where you take your ticket on entry and pay on departure (£13 for 24 hours). The car park is a 5-6 minute walk from the hotel. and is covered by CCTV. First Great Western Trains run a direct service to Bath Spa Station from London Paddington half hourly during the week. The journey takes an hour and a half. Journeys from Bristol Parkway take 35 minutes approximately. The station is five minutes walk from The Abbey, and taxis are always available. 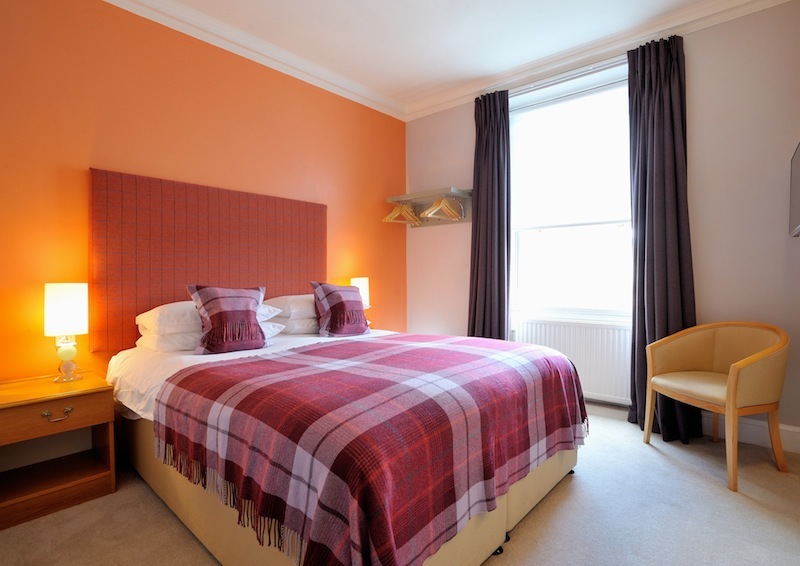 Located in the heart of the city of Bath within easy walking distance of The Abbey, The Roman Baths, The Holbourne Museum and many other city centre attractions including shops, cinema, theatre and only a few minutes walk from the station. Send an e-mail to The Abbey Hotel - Bath by filling in the form below. All fields are required.